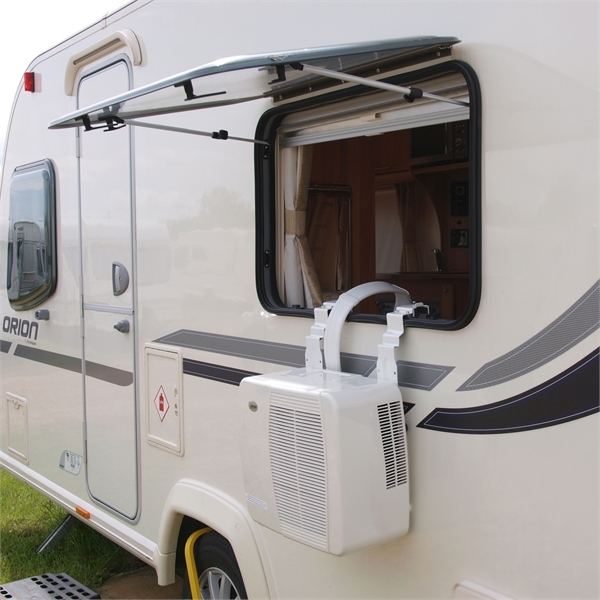 Reducing the humidity is as important as lowering the temperature to achieve comfort in your motorhome, caravan or camper. Our unit uses refrigeration to achieve the above goals. Think of refrigeration as a process of removing heat from one place to distribute it somewhere else. In a domestic fridge heat is taken from the inside of fridge and heat comes out of the grill on the back. Our air conditioning unit consists of two components; the evaporator and the condenser. The evaporator unit incorporates a fan that draws warm air through the cold evaporator coils which reduces the temperature and water vapour in the air condenses on the coil (rather like a cold beer on a hot day). The gas in the evaporator absorbs the heat and travels through the umbilical cord to the exterior unit, here the compressor pressurises the gas and it goes through the condenser and becomes subcooled liquid and travels back in to the evaporator in your van. Even if you have a caravan or motorhome with the latest insulation and seek out a pitch amongst tall leafy trees there are going to be occasions when your dear old camper is going to cook in the sun. Equally once the sun goes down and you feel happy to retract the blinds and throw open the windows the heat radiates from the ground and the humidity levels rise resulting in a sticky evening. The UK climate is getting warmer too, with record summer temperatures making even shady pitches uncomfortably warm. As any European camper knows 35ºC is often the norm in many parts of mainland Europe, especially the popular camping destinations of Southern France and Spain. But what about the environmental costs? The Cool My Camper unit has a very low power consumption of only 450 watts when cooling - that’s only 1.88 amps on 230 volts. Compare this with a large roof mounted unit that consumes 1500 watts and has a current draw of 6.5 amps. 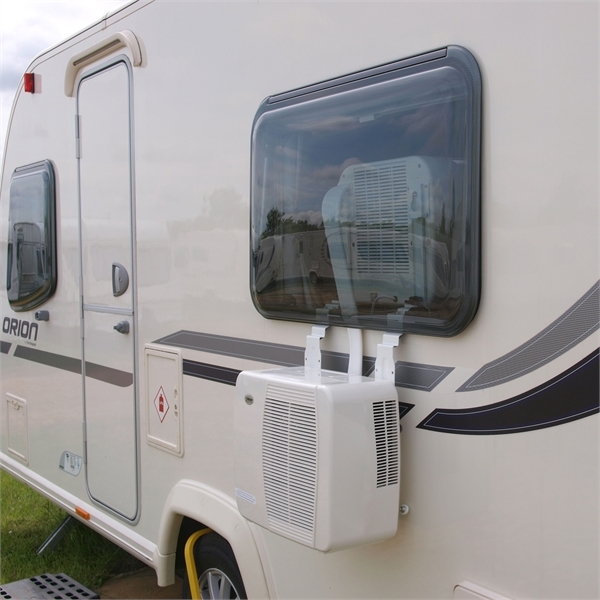 Okay so you will not get the same performance as a £1,600 to £2,200 roof mounted unit but if you want a little cooling for your camper it is really ecologically and worthwhile, thanks to its low running costs, flexibility and portability. Cool your motorhome – hook the condenser on your window ledge, pass the umbilical cord through the window and position your fan unit. Plug in and cool down. 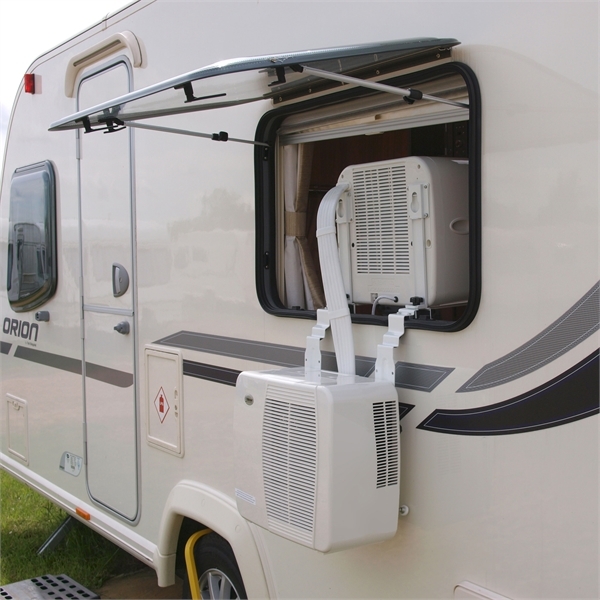 Cool your caravan - just like the motorhome, hook the condenser on your window ledge, pass the umbilical cord through the window and position your fan unit. If your caravan has a front lounge and a flat section on your A-Frame you can position the compressor on the fairing and put the fan unit on the shelf or table. This lightweight unit will not roll around, does not affect your towing nose weight and cools you. Happy campers!